Trees are such a precious gift from the Lord. They not only provide oxygen for us to breathe, but also food to eat, wood for building houses and furniture, pulp for paper, fuel for warmth, and shade for rest and recreation. In their great variety, trees provide natural beauty for our eyes to behold. Some species of trees are known for their special qualities. The "mighty" oak is known for its durability and strength. The "whispering" pine provides a soft hush in the background as the wind blows through its needles. The weeping willow displays its cascading branches that gracefully sway in the breeze, often overhanging a quiet pond. One of the most remarkable trees is the olive tree. Most of us are not too familiar with olive trees because they don't grow near where we live. However, in the land of the Bible, it was, and is, the most important of all the trees because it is a source of food, light, hygiene and healing. When I first came to Israel, I was fascinated by the olive trees which are found covering the terraced mountainsides in the Galilee, Judea and Samaria. They are beautiful to look at with their unique gnarled and twisted trunks and evergreen tops. Just looking at them you have a sense that they have a grace and character that sets them apart from other trees. As with other common symbols in Israel, the characteristics of the olive tree are used by the writers of the Bible to tell us more about God, about Israel, and our relationship to both. Olive trees, their fruit, and the oil of their fruit have long played an important role in the daily life of Israel. For nearly 6,000 years, olives have been eaten as a Mediterranean staple food and olive oil has been used for cooking, in lamps for light (Ex. 27:20, Lev. 24:2), for medicine, and for anointing oil in religious ceremonies (Ex. 30:24-25). By the time of the Roman conquest of Judea, the olive had become one of the most basic dietary items, even of the poor. The trees were always plentiful around the countryside and are known for their tenacity. They grow in almost any condition: on terraced hills or in valleys, in rocky or fertile soil. They can thrive in great heat with a minimum of water, and are virtually indestructible. Some grow from root systems 2,000 years old, yet the olive producer has to wait fifteen years for his first good harvest. It was an olive leaf that a dove from Noah's ark brought to Noah, "Then the dove came to him in the evening, and behold, a freshly plucked olive leaf was in her mouth; and Noah knew that the waters had receded from the earth" (Gen. 8:11). Whatever else succumbed to the flood waters, the hearty olive tree was still alive. At least since the time of Julius Caesar, one of the universal emblems of peace has been that of the olive branch. Olive oil was so plentiful in Israel that it was one of the products regularly exported. Solomon sent the King of Tyre 100,000 gallons (378,533 liters) of olive oil (I Kgs. 5:11). One thousand years later, during the time of Yeshua (Jesus), olive oil is mentioned in writings of that day as the only export of the Jerusalem region. The Mount of Olives, located just east of the Old City of Jerusalem, attests to the prevalence of olive trees around the city. Also, it was in the Garden of Gethsemane (Gat Shemen in Hebrew, literally, the place of the "olive press"), where Yeshua spent much of His time in Jerusalem with His disciples. "Coming out, He went to the Mount of Olives, as He was accustomed, and His disciples also followed Him" (Lk. 22:39). 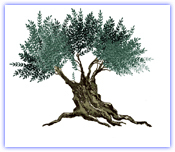 Primarily, the olive tree symbolizes faithfulness and steadfastness. Psalms 52:8 says, "But I am like a green olive tree in the house of God; I trust in the mercies of God forever and ever." No matter what the conditions: hot, dry, cold, wet, rocky, or sandy, the evergreen olive tree will live and produce fruit. It is said that you can never kill an olive tree. Even when cut down or burned, new shoots will emerge from its roots. This Scripture passage reminds us that no matter the conditions of life, we should remain steadfast as the olive tree in the presence of God - evergreen (faithful) and bearing fruit. Psalms 128:3 says, "Your wife shall be like a fruitful vine in the very heart of your house; Your children like olive plants all around your table." The analogy of your children being "like olive plants all around your table" would tell the ancient Bible reader that his offspring would be plentiful, hearty, and even dutifully responsive to the parents. All you have to do is look at almost any olive tree and you will see as many as ten or more new tree shoots growing up out of the root system around the tree. Psalms 128:3 would have been a comforting and faithful promise from the Lord! The most striking use of the image of the olive tree in the Bible is in Romans 11 where Paul describes the relationship between Israel (the Jewish people and God's ancient and ongoing covenantal relationship) and the Church. In fact, the entire three chapters of Romans 9-11 are focused on this topic and culminate with the olive tree image. (PLEASE take time to read this passage.) Paul shows us that the olive tree represents the covenants and promises to Israel, growing from its holy Root, which is the Messiah, the Word of God. The natural branches are the people of Israel. Those who turned away from that relationship were broken off. Christians are simply the wild branches grafted in among the natural branches to "became a partaker with them of the root and fatness of the olive tree," which God established (Rom. 11:17). It is evident from Scripture, as well as from nature, that the root and trunk support the branches, and not vice versa (11:18). In this position, there is no room for pride or the notion that we Christians have replaced Israel (the Jewish people), or that God rejected His own covenants and promises in the Hebrew Scriptures (the Old Testament). There is no room for boasting and arrogance, as the Church has been prone to do, as both the natural branches and the engrafted wild branches only remain by faith (Rom. 11:18-21). The Church is an extension of a plan that pre-existed it. Therefore, there should only be Godly fear (11:20) and thankfulness for the Lord's great mercies to us (11:33-36), as well as an attitude of love and mercy towards the Jewish people who are beloved for the sakes of the fathers (Rom. 11:28). After all, it is through Israel and His covenant people that God gave us everything we Christians hold spiritually dear! There is only one tree, not two, and we "wild branches" have been privileged to drink in new life from the cultivated, established tree. Historically, the Church has not honored these passages as it not only boasted against the Jewish people (the natural branches), but severely persecuted them to the point of death. Often, the Church has lacked even the most basic understanding of our Hebrew roots. Also, it has not recognized that we cannot fully grasp who we are, without acknowledging these roots. As a result, the historical Church has sadly perpetrated outrageous acts towards the "natural branches" (the Jewish people) during the Crusades, the Inquisition, the Pogroms, and even in the formulations of the teachings that became a religious justification for Hitler's Final Solution of the so-called "Jewish problem" in the Holocaust. Instead of mercy, Christianity showed contempt. The prophet Isaiah said, "Look to the rock from which you were cut and to the quarry from which you were hewn; look to Abraham, your father, and to Sarah, who gave you birth" (Isa. 51:1-2). Christianity did not spring forth from a vacuum. It sprang from the highly developed religious tradition and culture of ancient Israel. It is all too easy for us Gentiles to forget this all-important fact. For instance, if Yeshua were presented to us today, His "Jewishness" would probably shock most Christians. Yet, we know from Scripture that a woman once came to Him and touched the tzit-tzit, or fringes, of His garment (Luke 8:44). He wore the garments of Jewish tradition, just as many orthodox Jews do today, fulfilling the commands of the Law (Dt. 22:12). Likewise, the earliest church was a Jewish church. 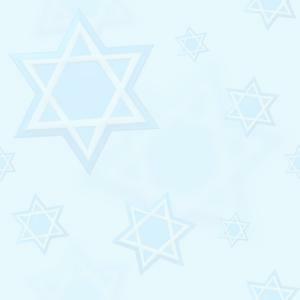 It was headquartered in the Jewish capital, Jerusalem, and was presided over by a Jewish leader. Yeshua said, "Think not that I came to destroy the Law and the prophets...I came not to destroy them but to fulfill them!" (Mt. 5:17). God is "the same yesterday, today, and forever" (Heb. 13:8). As Christians, we should see that Yeshua epitomized the Law and the teachings of the prophets as the living Word of God. And yet, so many of us know so little of the Tanach, the Hebrew Scriptures. Christians refer to these writings of the "Old Testament" as though the term "old" means it is of little value when compared with the "new." Yet, without the "old," the "new" loses much of its meaning, and it is often misinterpreted or not fully interpreted. When we do this, we are missing out on much God has for us in His Word. It was from this "Jewish/Hebrew" perspective that the Church began to reach out to the world of the Gentiles. It was as if Judaism had been uniquely tailored by Yeshua and the apostles to be made "attractive" to Gentiles. Gentiles would now be able to receive the Jewish Scriptures, to heed the Jewish prophets, and to sing the Jewish Psalms. As Paul went out with the Gospel message, he was careful to stress that the message was emanating from Jerusalem and Israel. He encouraged Gentile saints to collect funds for the needy in Jerusalem (I Cor. 16:2-4); he referred difficult doctrinal decisions to Jerusalem and to the Jewish elders there (Acts 15:2); his Gospel journeys usually began or ended in Jerusalem. He even gave the Gentile church an example of keeping Jewish feasts in Jerusalem (Acts 20:16). The Apostle Paul did something else as he ministered among Gentiles. He stressed the importance of keeping the right attitude toward Israel and the Jewish people. That attitude was to be one of humility (Rom. 11:20), mercy (Rom. 11:31) and kindness, even to the point of stressing an obligation in sharing material gifts with the people of Israel (Rom. 15:27). It was a wonderful ideal. But, in time, Paul's exhortations began to go unheeded. There were many factors which brought about the vast chasm which exists today between Israel and the Church. The two unsuccessful wars fought by the Jews against the Romans in AD 70 and in AD 133-135 undoubtedly did much to strain relations, since the early Church refused to help their Jewish brothers in these wars. Instead, in AD 70, the Church fled to Pella, across the Jordan River, following the warning of Matthew 24:16, believing the end of the world was at hand. The very vulnerability and isolation of the early Church also might have contributed to their sense of separation from those who began to persecute them. Finally, the early Church Fathers certainly did not help the situation, since many were openly anti-Semitic. The young Church fought for its life against Roman persecution from without and heresies from within. all this led the Church toward exclusivity and into taking a stand against its Jewish roots. With the conversion of Emperor Constantine in the early fourth century, and the subsequent "Christianization" of the whole Roman Empire, this anti-Semitic trend became crystallized. The Church moved rapidly to rid itself of all Jewish trappings. For example, the Christian holiday of Easter was divorced from its Jewish origins in the Passover; Saturday (Sabbath), the biblically prescribed day of rest and worship, was changed to Sunday; Pentecost was disassociated from Shavuot, etc., as the Church attempted to cast off the influence of "this odious people" (as the Jews were described by some Church leaders). A theology generally termed as Triumphalism began to be in vogue. The same theology has persisted to this day, occasionally finding renewal under different names, including Replacement Theology. Basically, this belief proclaims that God is finished with the Jews: that Christianity has indeed replaced Judaism and that the Church is the true Israel. This theology universally applies all the scriptural blessings to the Church, and all the curses to Israel. To show the fallacy of this teaching, read Romans 9-11 and everywhere it reads "Israel," replace it with the words, "the Church." You will quickly see how erroneous this theology is. Israel is Israel, even in the New Testament. And, when the Gentile Church is included in that concept, we are given that position by virtue of "grafting in," "adoption," "partakers," and being "made near:" never by "replacing." Of course, the almost immediate result of such a theology was the outright persecution of Israel by the Church. This malady has persisted through most of the 2,000 years of Christian history, contributing even to the Nazi Holocaust. It is surprising for most Christians to learn that Hitler only put into practice what the Church in Europe had believed and taught for centuries. Even today, after this awful disaster, anti-Semitism abounds in the Church. An example of this is seen in the fact that many otherwise loving Christians are suspicious of "those Jews." I see many pastors and parishioners who are happy to visit Israel and see where Jesus walked, but they have utterly no interest in the miraculous and prophetic renewal of the Jewish state, which is now in progress. Perhaps this is an expression of the ultimate in anti-Semitism, the denial that the Jewish people have any place in God's plan today. What we see prescribed in the Bible is a far cry from what we see in the Church today. We see that God had purposed from the outset that Gentiles are to be a part of His plan, but not the whole plan. We receive glimpses of this program of God as far back as Father Abraham. God promised the patriarch Abraham that he would be the father of multitudes of goyim (peoples, nations, Gentiles) (Gen. 17:4), and that all nations would be blessed in him (Gen. 12:3). This theme is carried on in the descendants of Abraham. We see it particularly in Joseph, who was married to a Gentile woman in Egypt. One of his children, Ephraim, was destined to become one of the most numerous and powerful tribes in the Northern Kingdom. The blessing upon the head of this little Jewish lad was this, that he would be the father of multitudes of Gentiles (Gen. 48:19). Much later, Ephraim was dispersed into the nations, along with the other nine "lost tribes." The dispersion of these Jews among the nations, their effect upon nations, and their recovery and restoration to their land, still remains a mystery too great for us to fathom. We see the theme picked up again in the woman Rahab, who was saved from the doomed city of Jericho and allowed to join with the people of Israel; and again as the prophet Isaiah describes the Messiah of Israel, called the "Root of Jesse." It is said that this Messiah would "stand as a banner for the peoples (Gentiles); the nations will rally to him, and his place of rest will be glorious" (Isa. 11:10). But perhaps we see the theme of Gentiles being joined to Israel most clearly in Ruth the Moabite, who was not only allowed access into Israel, but who became the great-grandmother of King David. The beautiful story of Ruth expresses for us most clearly what a proper attitude toward Israel should be. In fact, this woman seems to illustrate, in her life, most of the fruits of the Spirit mentioned by Paul in Galatians 5:22-23. She was truly devoted to her Israelite mother-in-law. She loved her with a deep love and commitment which led her to forsake her own heritage, and even her country, in order to be with Naomi. When Ruth arrived in Israel it was not with a feeling of superiority as many Christians have today. Instead, "she bowed down with her face to the ground..." (Ruth 2:10). She was willing to abase herself to a position lower than a servant girl?s (2:13). Her attitude was one of continual mercy and generosity as she shared her meager gleanings with Naomi (2:18). The life of Ruth was also marked with obedience (3:5), kindness (3:10), holiness (3:10), discretion (3:14), true love, faithfulness and commitment to Israel (4:15). Ruth said to Naomi, "Where you go I will go, and where you stay I will stay. Your people will be my people and your God my God" (Ruth 1:16). Perhaps in Ruth's life we get a visual example of what the engrafting into the olive tree of Romans 11 is all about. It is time that we, the Church, put aside our arrogance and, in humility, understand what it means to be that wild olive branch graciously grafted in by God to receive from Israel those everlasting covenants, promises and hopes that we have been "made near" (Eph. 2:11-13) -- lest we be broken off for our arrogance and boasting. Let us honor our roots and show love and mercy to God's natural branches!